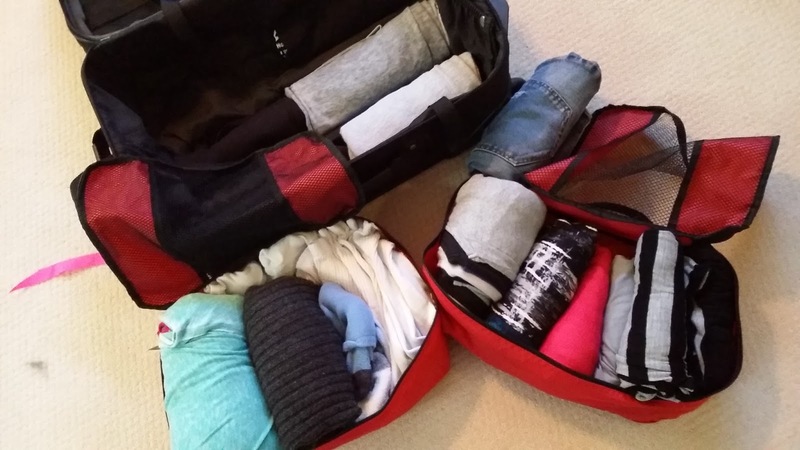 As promised, here is how I packed 11 days worth of clothes into a carry-on and overnight bag. I was determined to have my bags with me at all times, although it didn't always work out that way! (That's a story for another time, though.) You can see the majority of the clothes I took in yesterday's post: My Travel Wardrobe for Our Europe Trip. I also wanted to pack small because over the course of 11 days, we were on 6 different flights and in 4 different accommodations. That's a lot of moving around!! And I'm pretty sure we were all thankful that my bags were small when we were trying to fit 10 people's luggage AND 10 people into 2 small cars while we were in Spain and France. That was a bit of a challenge, but we all made it work. 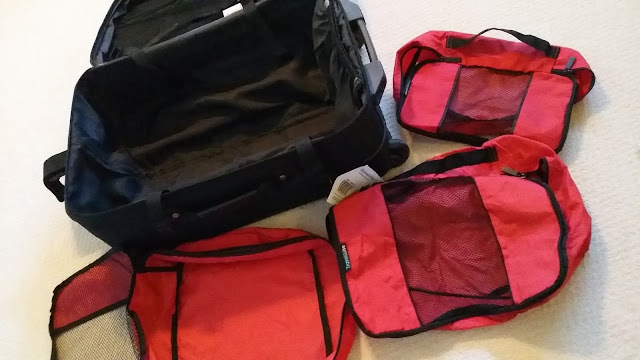 If you saw some of the packing videos and articles I posted yesterday in my Pack Like a Pro post, you saw that everyone (and their brother & sister) recommend rolling clothes, as opposed to folding clothes. This saves space and it helps to reduce wrinkles. 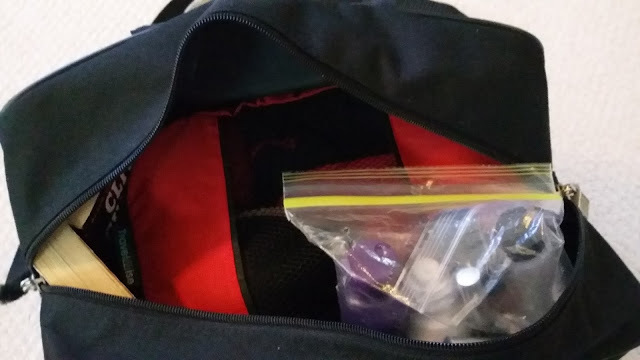 I also use packing cubes so that I have things somewhat separated and more organized. 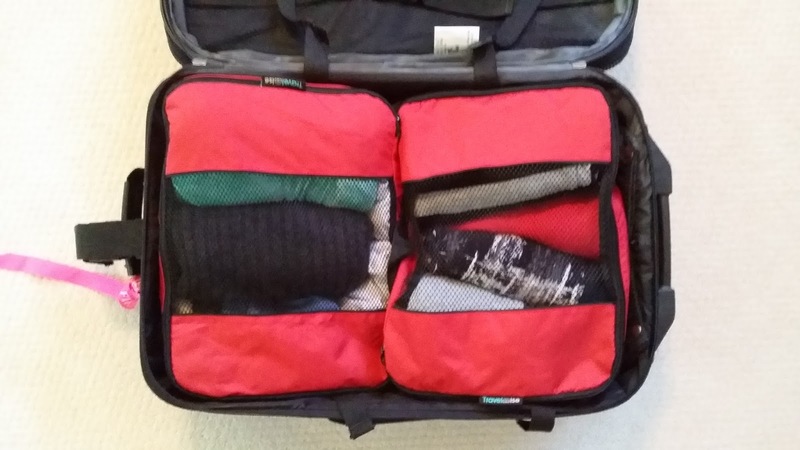 Two of the medium sized packing cubes fit perfectly side by side into a standard size carry-on suitcase. For this trip, I used two medium sized packing cubes and one small packing cube. I also wore my biggest, bulkiest items on the plane. 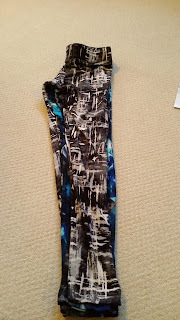 I wore a pair of compression leggings under my jeans. And I wore the short sleeve gray t-shirt and a blue hoodie. I carried my jacket and my neck pillow with me and wore my hiking shoes. My hubby said, "You should wear easier shoes to get off!" I told him I was used to traveling by myself with two kids, at one point~~ a toddler, a stroller, a diaper bag, wearing a baby, my purse, all the stuff and had to get three of us through security. Untying my shoes and taking them off??? When I'm only responsible for myself and not three people? Piece. Of. Cake. I can untie my shoes and take them off, honey. No. Problem. Plus, my hiking shoes turned out to be super-comfy. They were definitely a good purchase. All ready to go! Luggage, jacket & neck pillow were already packed away in the van at this point. Little did I know, I'd be wearing these clothes for 34 hours straight. 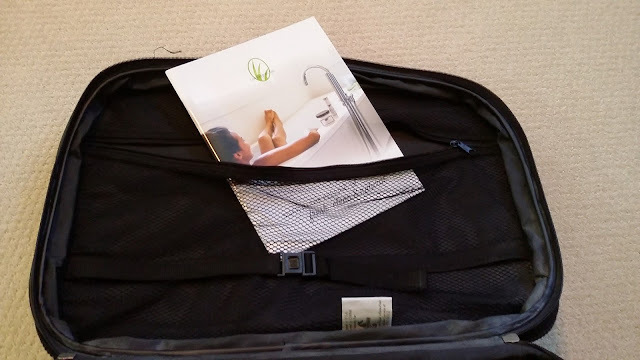 This carry-on is actually the one my hubby used. I borrowed a different one from one of our friends, which was actually a couple inches smaller than this one--but I've already returned it to them. So, for demonstration purposes, I'm using the one shown below. My hubby needed one slightly larger than me because he had big hiking/work boots that he needed to take and he had some BASE jumping gear he needed to take also. Surprisingly, he was also able to pack all of his clothes, BASE jumping gear, shoes, personal items and his rig (parachute, etc.) into 2 bags which we carried on. We totally rocked our packing game, y'all! I started by laying all like items in stacks; tank tops, long sleeve knit shirts, printed leggings. Then, I rolled them all up together and put them in the packing cubes. 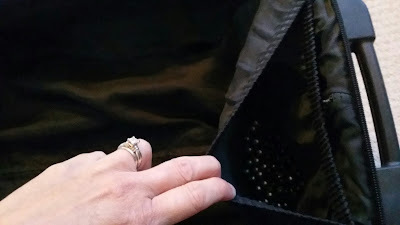 Some things I rolled individually, like my ruffled top, the black dress, pajama t-shirts, big sweaters, etc. All 4 tank tops stacked and ready to roll! 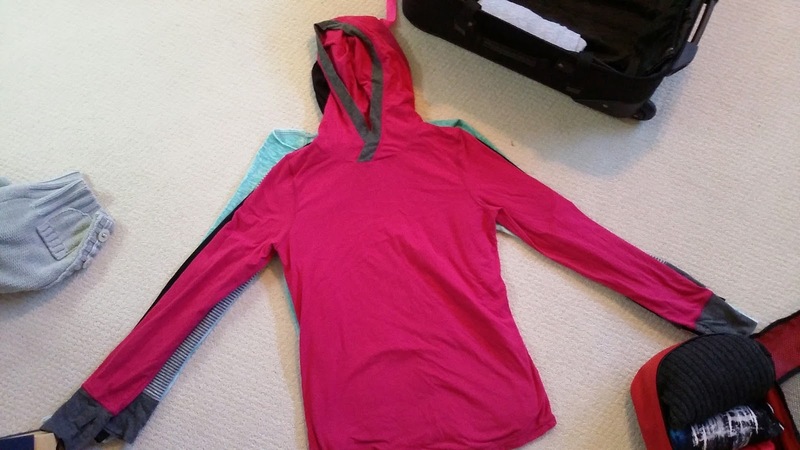 All items are ready to be zipped up and placed in the carry-on suitcase. 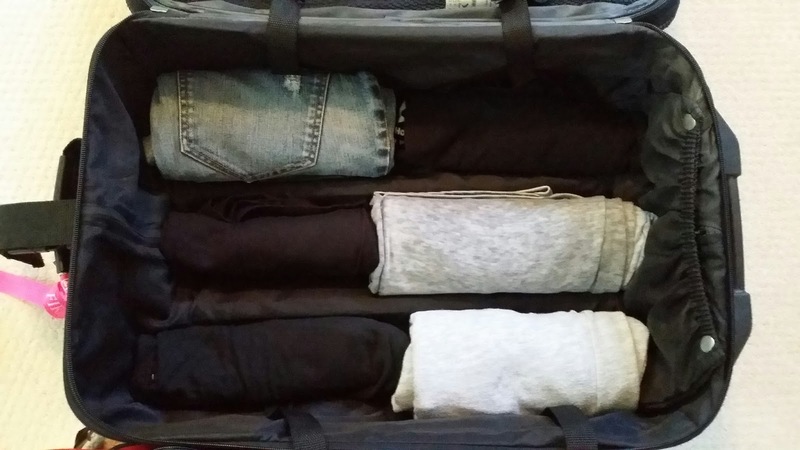 The packing cube on the right has the 4 tank tops, the 2 pairs of printed leggings, the pink knit cardigan, the gray ruffle blouse, the black & white cowl neck shirt and the black dress. The one on the left has all 4 long sleeve knit tops, the gray long sleeve cardigan and 12 pairs of socks. 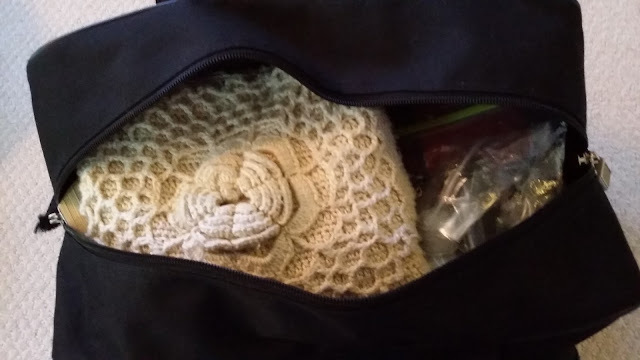 I attached a pair of earrings to one of my sweaters so that they wouldn't get lost in the mix, and then rolled it and put it in the packing cube with the long sleeve tops rolled together and the socks. 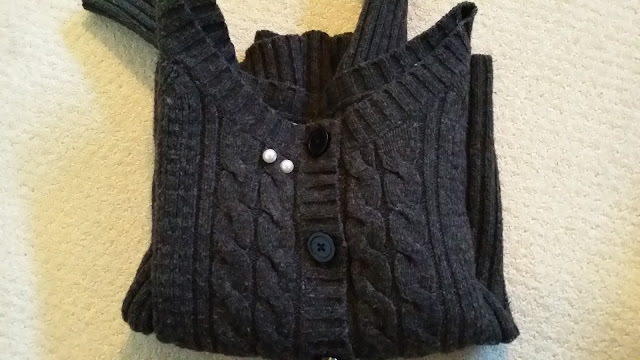 Attach earrings to a bulky sweater to keep them safe. With our soft-sided luggage, there are bars in the bottom that help hold the suitcase's shape. These bars create extra packing room where you can pack other rolled items underneath your packing cubes. 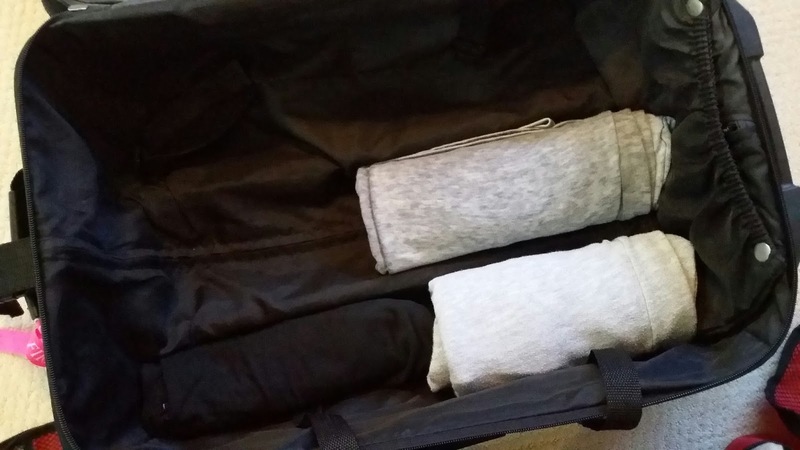 Roll individual items (I rolled my pajamas, a sweatshirt & jeans) and put in spaces between bars. 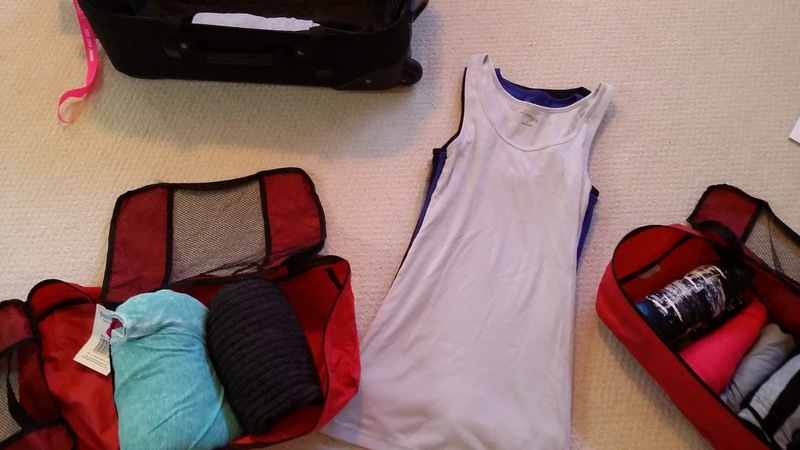 Place both medium packing cubes sided by side over rolled items that are put in space between bars. I put my beaded necklace in the side pocket. I put some catalogs in the zippered pocket. There's always time to share my love of Lemongrass Spa Products!!! I laid one of my bulkier sweaters right on top and then hooked the straps. Ready to go! The bulkier sweater laid flat on top of the packing cubes and got strapped in. 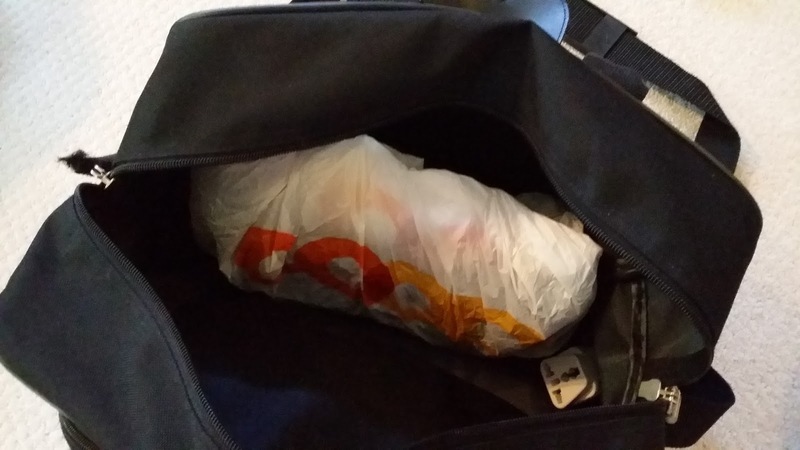 In my overnight bag, I put my extra two pairs of shoes, which I had in a plastic grocery bag. 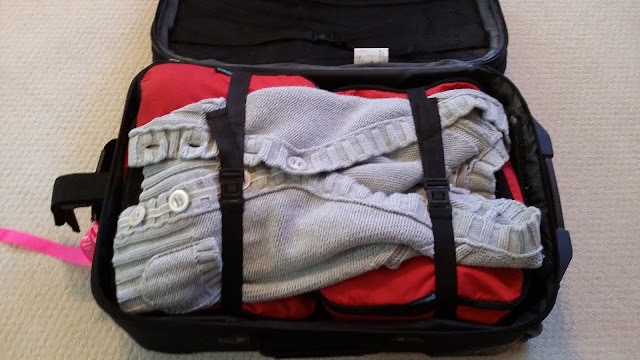 I put one of my small packing cubes which had my underwear, bras and scarf. I had two books in case I wanted to read on the planes. I also had my quart-sized bag of liquids on top for easy access while going through airport security. And I put my small purse in there since I was only allowed to have one personal item and one carry-on on the plane. Plus, I had my tablet down in the side. 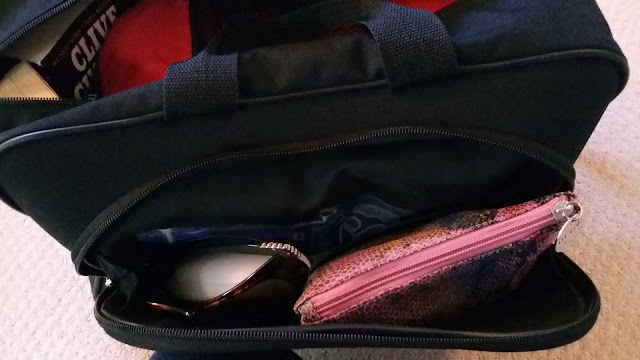 In the side pocket I had various non-liquid personal care items, my glasses, sunglasses, etc. Put shoes in sole to sole and wrap tightly in a grocery bag. These shoes both pack pretty flat. 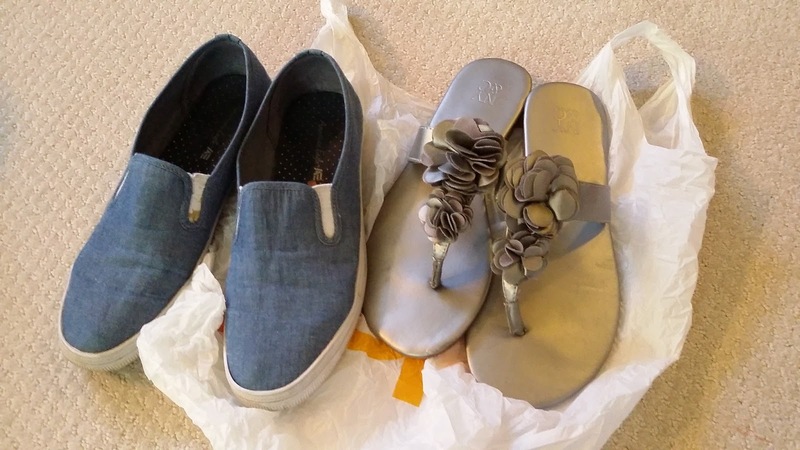 Place shoes in grocery bag in bottom of overnight bag. 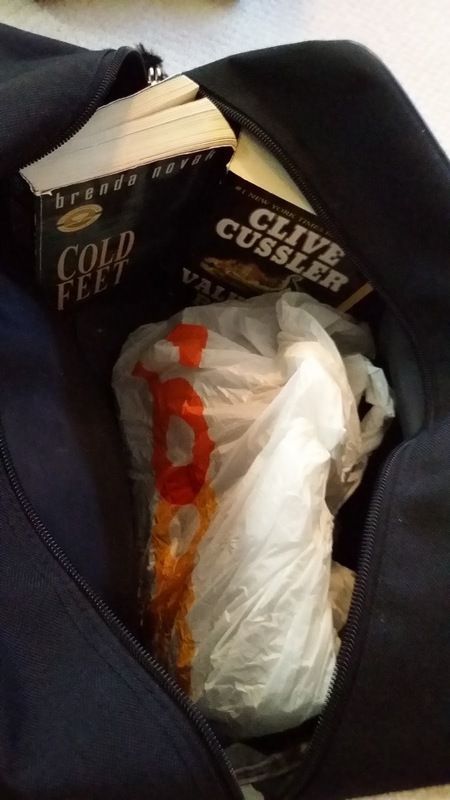 Put reading books on one end of bag, standing up. 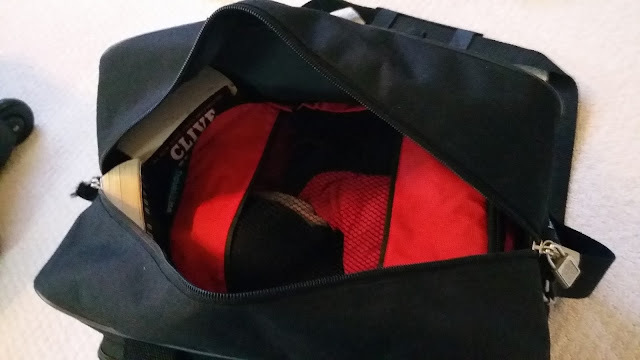 Put small packing cube with underwear on top of plastic bag with shoes. Make sure your quart-sized bag with liquids is easily accessible for going through security. A small cross body purse fits perfectly on top of everything else. All other personal care items fit in the side zippered pocket on the overnight bag. All set for the trip!! Let's go!! If you're on Instagram, you might have seen my photo from when I was ready 2 days before we left! 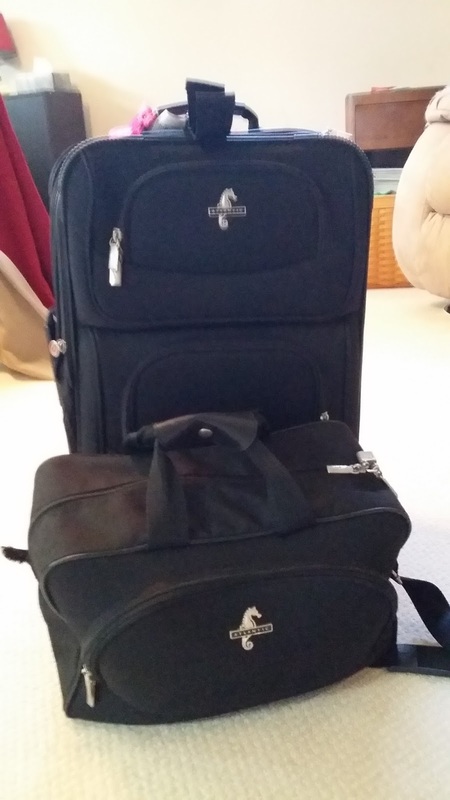 I did end up having to re-pack when my hubby and I had to do the old switcharoo on the carry-ons.